For a whole week we ate nothing but healthy meals made from our organic vegetable delivery box, and by the weekend I was feeling pretty smug and recommending wholemeal poha for a weekend treat. It was time, I decided, to take a long, hard look at my baking, replace maida (refined flour) with wholemeal atta (flour), sugar with agave nectar and this week’s recipe was going to be a red velvet cake made from spelt flour and beetroot. I even felt quietly chuffed when my husband said I was turning into a health food fascist. Then this happened. 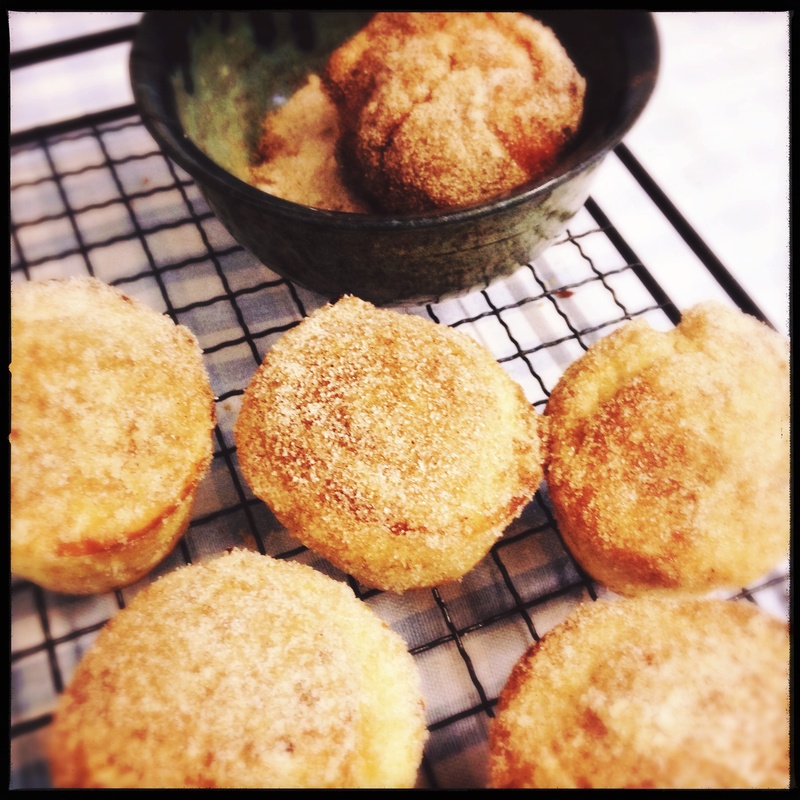 I made some of these doughnut muffins for Sunday breakfast and with one bite my resolve and new-found principles simply evaporated. They were so good, after I had eaten the first I would have sold my granny for another. I didn’t stop until I had eaten four—by late morning I was in a sugar coma. I decided right then that any life that didn’t contain the occasional taste of something as outrageously sweet and delicious as muffins that taste like doughnuts (and really, really good doughnuts at that) wasn’t the life for me. One downside is that they are almost too simple to make—certainly much easier than making doughnuts: They take about 30 minutes from weighing out the ingredients to wiping the buttery sugar off your chin. True, they’re not deep-fried like doughnuts so in a sense they are a little healthier, but they still have an awful lot of what keeps Robert Lustig awake at night. But if we all did exactly what we’re supposed to all the time, life would be terribly dull. And where’s the joy in a spelt and beetroot red velvet cake? Preheat the oven to 190 degrees Celsius. Grease a 12-hole muffin or 24-hole mini muffin tin—silicone trays are ideal here. In a medium-sized bowl, whisk together the flour, baking powder and salt. In a large bowl, beat together the butter and sugar for a few minutes until soft and fluffy. Gradually beat in the egg and vanilla extract. Add one-third of the flour mixture with half of the milk and mix well, repeat until both are fully incorporated. Divide the mixture between the muffin holes. If you want to make jam doughnuts, fill the holes one-third full of muffin mixture, add a teaspoon of jam, then cover with more muffin mixture. Bake for 20-25 minutes or until well risen and browned on top and a skewer inserted in the middle comes out clean. Leave the muffins to cool for a few moments, then turn them out on to a cooling rack. Put the caster sugar in a small bowl and the melted butter in another. While they’re still warm, roll the tops of the muffins in the melted butter, then the sugar. These are best eaten warm but will keep for a few hours if kept in a sealed tin. Frankly, you’re more likely to feel you haven’t made enough—three of us polished off 12 at one sitting. Desserted Girl – go for it – you won’t regret! Which brand of unsalted butter do you use in Delhi? Have seen very expensive imported options! Thank you. I am making them tomorrow. Can’t wait. Nice blog. Love the pics. The images are fantastic and inspiring!! For two years I have attempted wheat free grain free sugar free diet and my hubby has started eating in hotel restaurants..i am a Greek living in Mumbai and I surrender to my culture and my locale! I am off to make these babies now. 🙂 you won’t regret it!